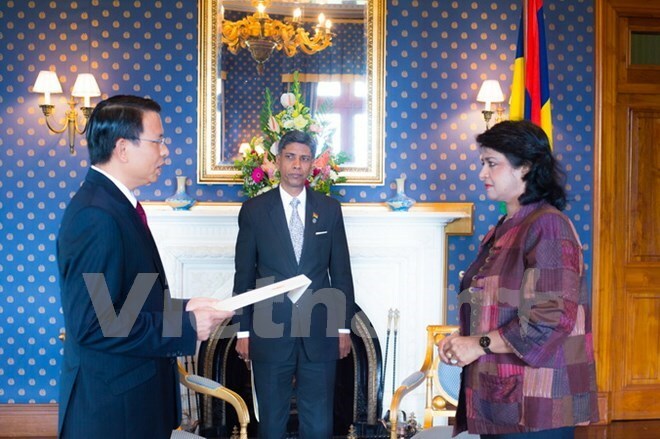 Pretoria (VNA) – Mauritius President Ameenah Gurib-Fakim has told Vietnamese Ambassador to Mozambique and Mauritius Nguyen Van Trung that the East African country is willing to act as a bridge for Vietnam’s services and goods to enter Africa. At a reception on November 10 for the new Ambassador, President Ameenah Gurib-Fakim expressed hope to strengthen connectivity among small and medium-sized enterprises of both countries as well as to develop joint projects in various areas such as apparel, aquaculture and tourism. The President affirmed that Mauritius supports Vietnam at multilateral forums, and backs the country’s establishment of an international centre for physics and mathematics under the sponsorship of the UNESCO. The Mauritius leader also lauded Vietnam’s success in realising many UN Millennium Development Goals, describing Vietnam as a model in poverty reduction, sustainable development and regional integration. The Vietnamese diplomat briefed the host on major socio-economic achievements of Vietnam during the “doi moi” (reform) process. He stated that the Vietnamese Government wishes to strengthen partnership with Mauritius in investment, finance-banking, aquaculture, maritime services, and tourism. He also thanked Mauritius for supporting and coordinating with Vietnam at international organisations, including the United Nations, UNESCO and Francophone. The same day, Ambassador Trung also paid a courtesy call to Mauritius Prime Minister Anerood Jugnauth and had working sessions with a number of local officials and enterprises.